August 15, 2012 / P.J. 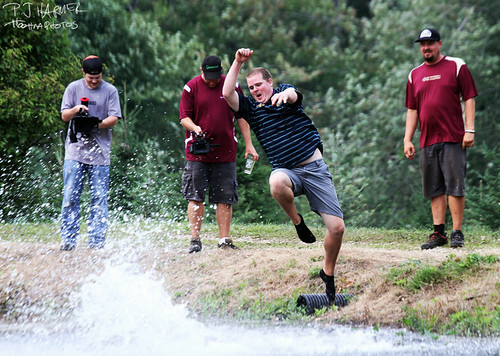 Nate Doss takes a plunge into the pond after winning the Vibram Open last year. Will Doss repeat or will someone else claim victory this year? This year’s Vibram Open is shaping up to be one to remember. And for the first time, the pros and ams are each getting in on the action. The Vibram is the final stop on the PDGA National Tour Elite Series. This year, the event expands to four days for the pros, running from Thursday to Sunday. On top of that, the Vibram has added an amateur tournament, which will be held at other area courses with the final being shifted to Maple Hill to play the vaunted gold tees. The men’s professional open field is smaller, but has a larger payout. A cap of 144 players has been set (it used to be 160), and the cut will remain at 72. The payout has gone from $41,000 to $45,000. The women’s payout this year has also gone up — from $8,300 to $10,000. The Vibram also allowed any and all women to compete with the cut line being 15. The Vibram has also gone from three to four rounds. The pro tournament will run from Thursday through Sunday at Maple Hill in Leicester, Mass. One of the most scenic courses on the tour, the championship gold tees challenge the best in the world with tricky woods shots, long drives and creative water holes. As the crowning — and final stop — on the PDGA Tour, more than just a victory will be on the line as the tour champion will be crowned at this event as well. Three-time world champion Nate Doss won his first Vibram Open title last year. His first title also guaranteed another year without a repeat winner at the Vibram, dating back to 2004, when the tournament was known as the MSDGC. Doss shot a final-round 56 for a 164 total, earning the $3,000 check and a three-shot victory over Nikko Locastro. Paul Ulibarri, Paul McBeth and Steve Brinster were all tied for third, six shots behind Doss. Ricky Wysocki placed eighth last year at the Vibram Open, but enters this year’s tournament as one of the hottest players with three straight wins. Could Wysocki be the person to beat at this year’s Vibram? Who will claim this year’s prize? Eyes have to be on Ricky Wysocki, who has won tournaments for the past three weekends, including the Brent Hambrick Memorial, a National Tour event in Columbus, Ohio that ran two weeks ago. 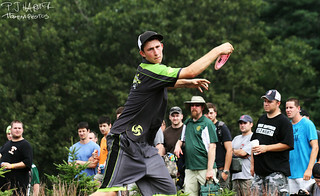 He also has victories at the Pittsburgh Flying Disc Open and the Rochester Flying Disc Open. Tour points leader and 2012 world champion McBeth also can’t be counted out. McBeth has won seven tournaments this year, including two NT events. McBeth has earned 283.5 points this year on tour to hold a slim lead over Will Schusterick, who is second with 281. Dave Feldberg (279), Doss (263) and Wysocki (259.5) round out a top-five that could make the final push for the tour championship an exciting one. Reigning champion Sarah Hokom won’t have it easy at the Vibram as she attempts to defend her title against a strong women’s field. Hokom, the 2012 world champion, won last year’s crown by beating Sarah Stanhope by one stroke and NT champion Val Jenkins by six strokes. Paige Pierce and Catrina Allen were each seven strokes behind Hokom. Sarah Hokom is seeking her second straight Vibram title. Jenkins leads the NT points series with 295 points. Allen is second with 288, followed by Pierce (281) and Hokom (274.5). Hokom has seven tournament victories this year, including one on tour. And as defending champion and the reigning world champion, she might be considered a slight favorite. But Jenkins has eight victories this year, including two on the NT. One thing also to consider with Jenkins — of the 16 tournaments she’s played in this year, in 14 she’s been first or second. The other two? A third and a fourth. There’s no doubt that she’ll be one to beat as well. And with other top players in the field, this could be a fun field to watch. For the first time, the amateurs will be in on the Vibram fun. The amateurs have a C-Tier level event that will cover four rounds. The first three — two on Friday and one on Saturday — will be played at Hyland Orchard. The final round, after the cut, will be at Maple Hill on Sunday. According to the PDGA list of players, 89 are listed as playing — 85 being men and four being women. The tournament is set up for just advanced-level amateurs. A reasonable entry fee and a loaded player’s pack and the true Vibram treatment makes this one heck of a deal for top-level amateurs. For those of you who can’t be in Massachusetts for the tournament, there are ways of keeping track of what’s going on. The Vibram Open’s live coverage website mentions that a video feed, audio feed, Twitter feed and other items will be on the page. The PDGA will also offer live scoring for all players in all divisions, beginning at 8 a.m. Eastern on Thursday. I’ll be checking out the action. Got to go last year for the first time and loved it. Going back this year. If you are nearby, check out how the best in the world play on an extremely tough course. For me it’s worth the hour and a half drive.